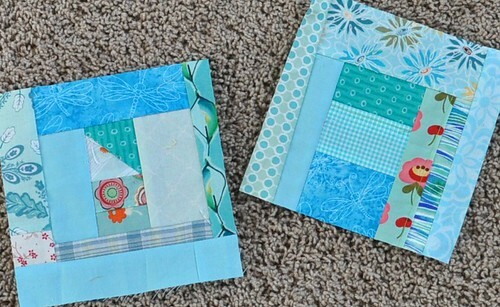 I've been working on a few different projects and quilt blocks and it's finally time to blog about them. 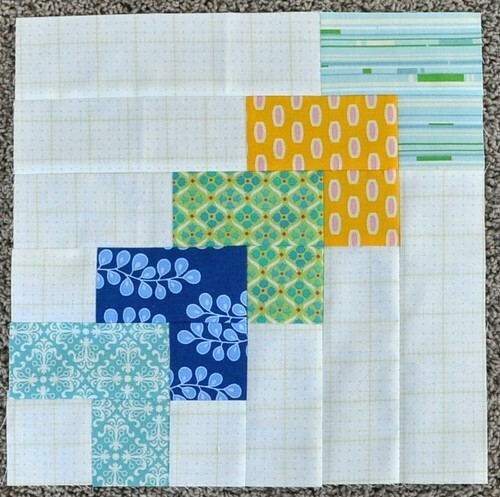 These are the (late) May blocks for my do good stitches group. 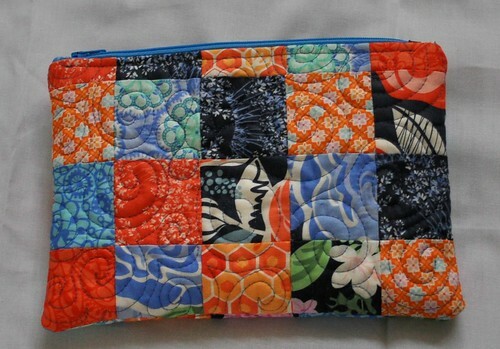 The pattern is from Sew, Mama, Sew (but modified for a 12" block) and I didn't follow the instructions. 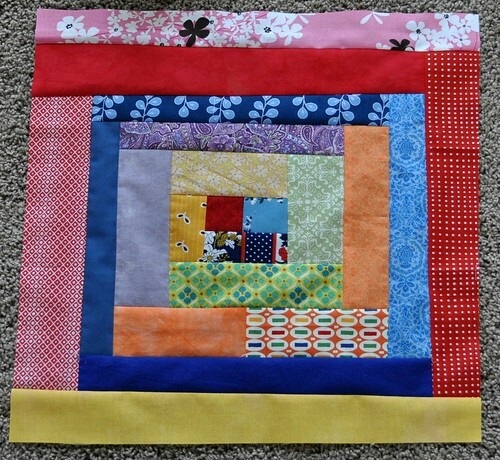 I put mine together half-log-cabin style and the pattern directions suggest sewing it together in straight rows. Which makes sense because it would have been way quicker and easier. These are a couple more scrap blocks to add to my slowly growing pile. 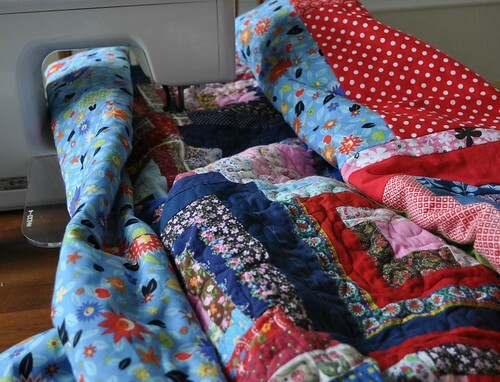 I sorted scraps today and I'm thinking I might need to focus on scrap quilts for the summer or something like that. Need to make a dent in the pile o scraps. 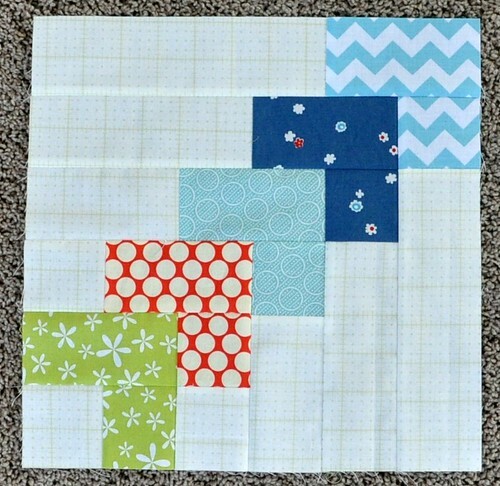 My request for group members was to make "boyish" blocks with red, yellow, blue and their preferred neutral (could be solid or printed white, offwhite, gray, brown, whatever.) 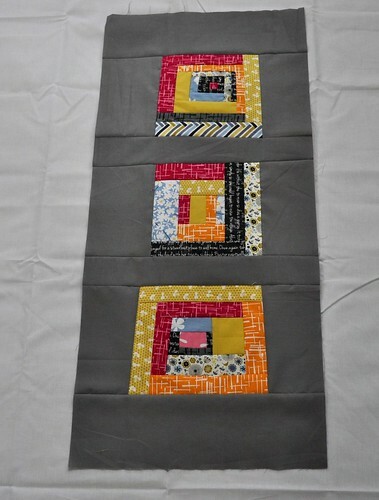 And also to make sure the middle diagonal row was an obvious dark or light. With the variations of colors and those obvious diagonals, I think the quilt top is really dynamic and just...full of energy. 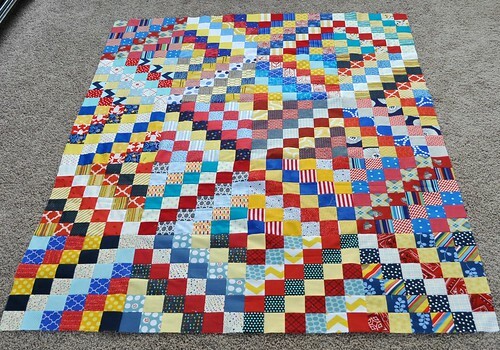 This quilt top has 20 scrappy trip blocks and it measures 61" x 49". I still need to tuck in thread ends, I know. 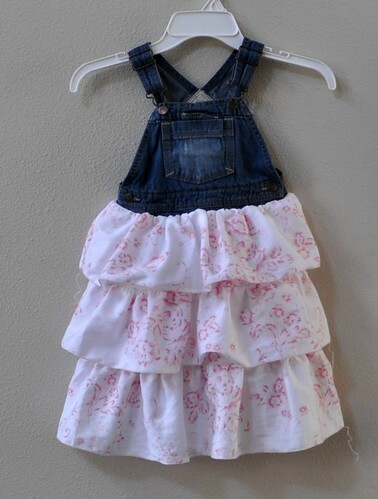 I cut off the bib part of her overall shorts that I got a couple years ago for the bodice, and made the skirt with a clearanced cloth shower curtain I got at Target sometime last year. I'm not sure about it. The skirt pattern is from Ottobre Design issue 3/2006 (it's on the cover) and the ruffles are a bit over the top compared to what she normally wears. The other thing (really, the main thing that's bothering me) is the overalls "bodice" is longer than the one in the actual pattern, so the skirt doesn't really have that empire look it has in the original pattern. I'm considering taking the skirt off of the overalls and making up the bodice from the pattern; and then attaching a different style skirt to the overalls bodice. I'm not sure what I'll do yet but it's always a bummer when things don't turn out the way you envision them. 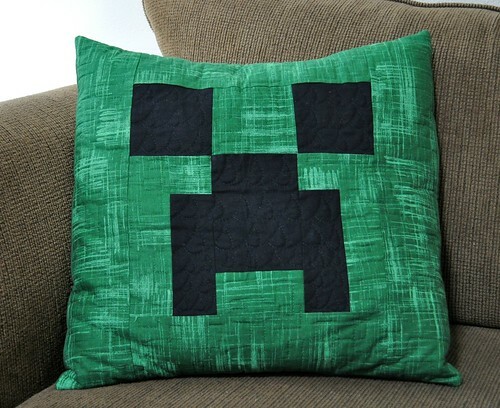 I'm finishing up a teacher gift next week (maybe a couple) and also making the back for my son's creeper pillow. And working on scrap blocks. What are you working on?